Primor (sulfadimethoxine/ormetoprim) is a broad-spectrum antibiotic combination used to treat susceptible bacterial infections in dogs. Primor is for the treatment of skin and soft tissue infections (wounds and abscesses) in dogs caused by strains of Staphylococcus aureus and Escherichia coli and urinary tract infections caused by Escherichia coli, Staphylococcus spp., and Proteus mirabilis susceptible to sulfadimethoxine/ormetoprim. How it works: Primor is made up of two antibiotics: sulfadimethoxine and ormetoprim. Together, these antibiotics are even more powerful than when they are used alone, as they block two sequential steps in bacterial folic acid synthesis. The net effect is not only the limiting of bacterial growth, but the killing of bacteria as well. 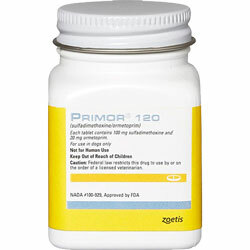 HOW SUPPLIED: Primor is available as scored tablets for the following potencies: 120 mg, 240 mg, 600 mg, and 1200 mg. Cautions: Do not use in pregnant or nursing animals. Your pet should be encouraged to drink plenty of water while being given Primor. Before giving Primor, be sure to tell your veterinarian what other medications or treatments your pet is receiving.